Interview with Sri Vivek Godbole, Founder, Sri Krishna Yajurved Pathshala, Satara. The following interview was carried out by the eCoexist team, in 2008. The aim of it was to clarify the scriptural aspects of the festival and understand the links between Nature and Ganesh Chaturthi. Sri Vivek Godbole is a Vedic scholar specialising in the Taittareya branch of the Sri Krishna Yajur Veda. 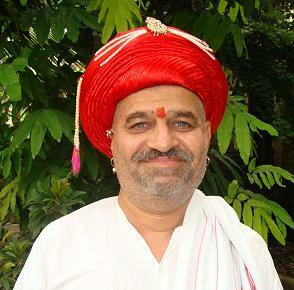 He is the founder of a Vedic school in Satara, Maharashtra and a staunch lover of Nature himself. His thoughts on Ganesh Chaturthi have inspired the efforts of eCoexist in this regard. They will also clarify completely that there is no conflict whatsoever in the scriptural practise of Ganesh worship and the efforts to conserve our environment. Q: Could you please explain the origins of the Ganesh Chaturthi festival? A: It is very important to understand the roots of the Ganesh Chaturthi festival to be able to taste the true joy of celebrating it. ‘Gana’ stands for collective and ‘Ganapati’ is the one who brings people together, who presides over them. This includes all kinds of people – scholars, artists, athletes, businessmen and labourers. He is the one who unites human society. This is in fact the true meaning of ‘devotion’. That which creates unity within individuals and with the Universal energy. Ganpati is also considered the deity of knowledge ‘jnandatri’ – the one who bestows knowledge and understanding. This is why it is necessary that we understand what we are doing and why, so that we receive his gift of knowledge. The beginnings of the Ganesh festival can be traced back to a time when most of the populations of India lived by a source of water, usually rivers. According to the Indian calendar, towards the end of the month of Jhyestha, when the constellation of Mriganakshatra is sighted, we begin to see the first signs of the rains. This is when a series of festivals, Maati che Tyauhaar, respecting the Earth begin. The first of these is the festival of Bendur, which falls in the month of Aaashadh. Following this comes Naag Panchami, in the month of Shraavan, when we worship the snake. These festivals express our gratitude to all the elements of Nature, those that we see as directly beneficial as well as those that we may fear. Finally, in the month of Bhadrapada, on the fourth day arrives Ganesh Chaturthi. In ancient years people used to bathe in the rivers. In the monsoon season, the waters of the rivers are fresh and clean and the banks of the river rich with freshly deposited fertile soil. People would take this fresh sediment and worship it. This wet fresh and fertile soil was given a form by each devotee themselves. Each one of us has an artist within us and making the Ganesh idol was itself a form of worship, of experiencing and visualising the divinity in the soil. The worship of Nature, the Earth, and the species that inhabit the Earth, is the recognition of the existence of the same elements within ourselves. All living beings are made of the same five elements and these festivals recognise and acknowledge this inherent Unity. This was the beginning of Ganesh Chaturthi. Q: What is the original process of this worship? A: Once Ganpati arrives home, there is an outbreak of joy and excitement in the household, and questions about how best to welcome him. Whatever we choose to do, it is important that it is done with love, devotion and true feeling. It is only through such feeling that we truly experience him within us. We invite him into our homes, to be part of our family. We install him in our hearts. We offer him sacred sounds and pray that the elements within us come alive in him as well. Recognising that this mound of earth is, in its essence, divine, we pray to it to bestow upon us joys and to take away sorrows. Q: Can you comment on the materials used for worship? A: In the offerings that we make to Sri Ganesh, each item has its own significance and is all symbolic of our deep links with Nature. Originally, all of these came directly from Nature and did not have any chemicals in them. Turmeric powder and natural kumkum made with turmeric, sandalwood paste and rice grains make up the basic offerings in any pooja. Each of these substances have a medicinal effect on the body, turmeric is an antiseptic, kumkum and sandalwood are cooling. Having recognised the Unity between ourselves and the diety we offer the same substances to him as well as apply them to ourselves. The practise of applying kumkum to the forehead is also a ‘darshan’ of the Sun God, the forehead of our body is like the vast horizon on which this fiery ball of light arises in the point between the eyebrows. In this way, offering kumkum to the Ganesh idol is an offering of light. The other offering of great importance in a Ganesh pooja is the Durva grass. This grass which grows in great multitudes also strengthens ones memory. Since Ganesha is the lord of knowledge, the Durva grass is preferred by him. The ‘modak’, made of jaggery, rice and coconut is another one of his favourites. This sweet dish which is boiled rather than fried, is nourishing and does not harm your health in any way. Q: Why is it necessary to do a pooja? A: Each devotee needs to find his or her own way of prayer, unique to his individual personality. The efforts that we put into this celebration are all a form of doing pooja. The talents that we offer in display to the idol are also a form of pooja. Pooja finally is a communication between us and the Universal energy. We offer our talents and efforts as a form of gratitude for what we have received. Pooja is ‘darshan’ not ‘pradarshan’. It is the vision of the presence of the Lord within us, not the display of our accumulations and achievements. Q: What should the size form and colour of the idol be? A: The original practise of making an idol oneself also limited the size of the idol. It could never have been 10 or 15 feet high. It must have been an idol the size of our palm which one could easily carry home cradled in our arms. This idol may have hardly been painted in bright colours, except with the natural substances available at hand, such as turmeric and kumkum. It was humbly decorated with flowers and love. As for colours, the lord is coloured with our devotion and returns this love manifold! Q: How has the form of the Ganesh festival changed over the years and what were the forces that led to this change? A: The initial practise of making ones own idol slowly started getting refined with the involvement of the potter community. The small idol that was made from fresh earth by families themselves would start to develop cracks within a day and a half and then it would be taken back to the rivers and returned to where it came from. As the material the idol was made from became more and more sturdy, the festival duration also increased to three, five, seven and then ten days as people became attached to their idols and wished to prolong the festivities. When Gauri came to be attached with the festival the five day festival continued to seven days and Gauri was immersed along with Ganpati. Finally, several communities would observe the Ananta fast and the festival went on until Ananta Chaturdashi to become a ten day festival. Along this path of evolution, the simple home made idol became fancier, received colours and decorations and finally the natural clay was replaced by Plaster of Paris, as it offered several conveniences to the sculptors. The original simple intimate Ganesh pooja, then took on a social angle and extended beyond the house and family to the neighbourhood and the community. The art of making idols took on a commercial significance as it supplemented the income of the potter community and finally businesses developed only around the making of Ganesh idols. With the advent of commerce, the attitudes of devotees have also become one of bargaining with the Lord and prayers are now done with expectations of recieving something in return. True devotion involves complete surrender to the Universal will and inner offerings of gratitude. A recognition of the unity and beauty of all of creation. Q: How do we address the environmental issues that arise from the Ganesh festival? A: We must all become aware of the nature of true bhakti. Devotion does not mean being ignorant of the impacts of our actions. After conducting a beautiful pooja at home if we are unconcerned about the state of the river in which we want to immerse our idols then how are we worshipping the Lord of Knowledge? What knowledge have we gained? We need to look for the right choices to make. Choosing an idol that is made of natural clay and demanding it will ensure that these are made available in the markets. Shouldn’t your devotion be so deep that you ensure that no living being or natural element is harmed by your actions? Rather, even if you didn’t bring a Ganpati idol home every year, he is not going to be upset with you. If one has expectations of earning merit one must ensure that we perform meritorious actions. Make choices that spread harmony amongst the human and natural world, you don’t need loudspeakers to communicate with the Lord. Activities that damage our own health and those of others do not connote devotion. Education involves reflection on our own actions and choices. Worship rituals should bring us joy, peace and freedom from anxiety. If you immerse your idol in your home, there is no question of conflict with any tradition. The idea of immersion is to ensure that what has come from the earth returns to the earth. You can ensure that the water you use for immersion is free from any waste and clean. Once the idol has dissolved this water can be offered to the plants in your own garden, and in this way Sri Ganesh will have returned to the Earth where he came from. The use of thermocol and plastic in decorations also needs to be avoided. We seem to have come further and further from natural materials in the way we live today. At least in matters of faith let us make an effort to return to Nature. Similarly, the nirmalya generated through the rituals could be converted into compost and fed as nutrition to the plants around you. We do this regularly ourselves in our Ved pathshala in Satara. This can only be beneficial to us and those around us. Q: What does the form of the Ganpati symbolise? A: If you observe the body of Ganesha, it consists of a human form with the head of an elephant. Often people wonder about this strange combination. Reflect upon the nature of the elephant. It is an herbivorous animal that is extremely strong. It lives in a community and travels with the female guiding it. Humans share several qualities with the elephant. It enjoys a fantastic memory. Research is now showing that elephants are capable of expressing emotions such as joy, sorrow and deep loyalty within its communities. They even mourn for those who have died among them. The form of Ganesha is one that unites humanity with the rest of creation. The human world and the animal world. That symbolises strength and intelligence. The myths that go along with the origin of this unique form involve a story between Shiva and Parvati. Yet it is important to go behind the myth and understand its deeper meanings. Ganpati has four hands. One is held out in the ‘abhay’ mudra which bestows fearlessness. Yet to acquire fearlessness, we need to unite as a community. The idea of Sri Lokmanya Tilak to make this a social event was to create this unity amongst people. The vehicle of Ganesha is the mouse. Why the mouse? The mouse has ability to break down substances into their tiny parts. We need to develop an intelligent mind that is capable of understanding things in detail, which enters into the depth of matters. Ganesha also carries snake around his waist, which is a symbol of the energy which resides in all human beings. This energy can be used both beneficially or for destructive purposes. The position of the snake at the navel of the murti is a symbol of ‘vyaan’ an aspect of Vayu – the element of air within the body. There are several verses praising the glory of Sri Ganesh. Learn them, understand them and sing them with your own voices. This will bring you the grace you seek. Ganpati is connected to the natural cycle. When we bring this small mud idol home, we offer it all our love and devotion. This idol which collects our positive thoughts and energies is then returned to the earth, either through the rivers or even at home, it carries our goodwill to others and to our environment. We then are united through the earth, the waters and through our goodwill. We need to bring this awareness back into the way we perform our rituals. May we pray to Sri Ganesha that we receive the intelligence to make the right choices in our lives. To choose the right quantities of the appropriate substances. Ganpati is not about competing with each other. May we pray that we be able to return to simpler and more natural ways of being, and in doing so we are able to reconnect with Nature. Being educated is different from being cultured. Being cultured involves taking responsibility. True devotion can never be quantified by outer displays. It is the one thing that takes us deeper within to our own inner joy.